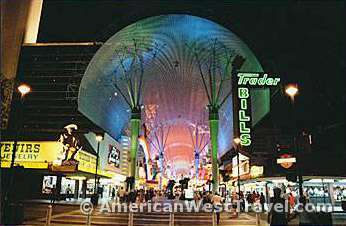 What To See and Do in Las Vegas features activities and attractions in the city of Las Vegas. 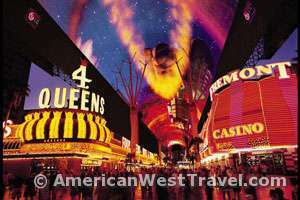 Includes unusual and quirky attractions, links for online maps of the Las Vegas Strip and the Downtown Las Vegas areas, and details about public transportation. The Mob Museum (The National Museum of Organized Crime and Law Enforcement). Location: 300 Stewart Ave (Steward Ave and 3rd St, downtown Las Vegas). Phone: 702-229-2734. The publicly funded museum opened in a former federal courthouse. Completed in 1933 and listed on the Nevada and National Registers of Historic Places, it houses the very courtroom where one of 14 national Kefauver hearings was held in the 1950’s to expose and control organized crime in America. Its exhibits include the brick wall shot up during the 1929 St. Valentine’s Day massacre in Chicago and the barber chair that Albert Anastasia was murdered in. Stratosphere Tower. Location: 2000 South Las Vegas Blvd. The 1,149 foot tower, part of the Stratosphere Hotel complex, offers panoramic views of Las Vegas from observation decks at the top. Also, a number of exotic thrill rides which use the outside of the tower. Circus Circus Hotel – Adventuredome. Location: 2880 South Las Vegas Blvd. An extravagant five acre indoor theme park at Circus Circus Hotel. Features a rollercoaster, white-water raft ride, IMAX theater, and more. Treasure Island Attractions. Location: 3300 South Las Vegas Blvd. Features Mystère, a Cirque du Soleil production. The Venetian Attractions. Location: 3355/3377 South Las Vegas Blvd. Features Gondola Rides (indoors through the Grand Canal Shoppes and also outdoors); Madame Tussauds where visitors can take pictures, mingle, and even touch the incredibly lifelike wax figures; and Streetmosphere where street performers can be found entertaining guests along the walkways at the Grand Canal Shoppes. Madame Tussauds, Las Vegas. Location: 3377 South Las Vegas Blvd. The world famous wax museum offers seven rooms, each with a different category of A-list celebrities. Mirage Attractions. Location: 3400 South Las Vegas Blvd. Features a fabulous 20,000-gallon aquarium, an indoor rain forest, an erupting 54 foot volcano, and Siegfeld and Roy’s Secret Garden which houses a dolphin habitat and some of their most exotic animals. High Roller at the LINQ. Location: 3545 South Las Vegas Blvd. The 550-foot-tall High Roller is the world’s largest observation wheel and the centerpiece of the LINQ, the Strip’s all-new outdoor shopping, dining, and entertainment district. Caesar’s Palace Attractions. Location: 3570 South Las Vegas Blvd. Witness the rise and fall of the Lost City of Atlantis in a 50,000-gallon saltwater aquarium. Located inside the Forum Shops at Caesar’s Palace. Bellagio Gallery of Fine Art. Location: 3600 South Las Vegas Blvd. Offers some of the best fine art from around the world through rotating exhibits. Paris Las Vegas – Eiffel Tower Experience. Location: 3645 South Las Vegas Blvd. Don’t miss the view from the single most romantic spot in all of Vegas – 460 feet above the heart of the Strip atop the Eiffel Tower Ride. New York-New York Attractions. Location: 3790 South Las Vegas Blvd. Visit replicas of the Statue of Liberty, the Empire State Building, or the Brooklyn Bridge. The Manhattan Express Roller Coaster will lift you up 203 feet, drop you down 144 feet and leave you coasting at 67 mph. This Las Vegas ride experience simulates a jet fighter’s barrel roll while taking you on the famous “heartline” twist. Mandalay Bay Shark Reef. Location: 3950 South Las Vegas Blvd. Fantastic aquarium complex with the focus on sharks and other sea predators. Welcome to Fabulous Las Vegas Sign. The sign is located in the median strip at 5100 South Las Vegas Boulevard, north of the historic stone pillars of the old McCarran Airport on the east side, and across from the Bali Hai Golf Club. There is a 12-car parking lot south of the sign which can also accomodate two buses or limos. To access the parking lot, drive south on Las Vegas Boulevard heading away from the Mandalay Bay Resort. National Atomic Testing Museum. Location: 755 East Flamingo Rd., between Paradise Road and Swenson Street. 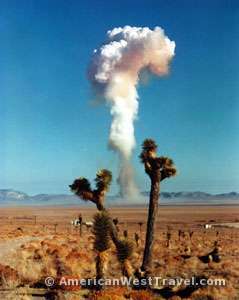 Features permanent and changing exhibits related to the Nevada Atomic Test Site which was active from 1951-1992. Cirque du Soleil. The spectacular and world-famous show generally has different ongoing versions playing at a number of local hotels. See the website for the current schedule. The Neon Museum Las Vegas. This quirky “museum” offers tours of its Neon Boneyard, a fenced-in area downtown (at the corner of E. McWilliams Ave and N. Encanto Drive) containing hundreds of neon signs that once lighted up casinos, hotels, motels, and businesses along The Strip. Call (702) 387-NEON or go to their website to arrange for a tour. Make your reservation as far in advance as possible as tours often sell out. A very limited number of walk-in tickets are available and can only be purchased at the Neon Museum the day of the tour and in person. 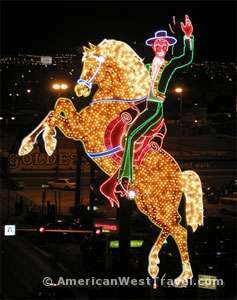 If pressed for time, take in the Las Vegas Boulevard Signs Project, a self-guided tour of about nine fully restored neon signs from the Museum collection along Las Vegas Boulevard, illuminating downtown Las Vegas. Pinball Hall of Fame. Location: 1610 East Tropicana. World’s largest collection of pinball machines. A dedicated 10,000 square foot museum of fully restored and playable pinball machines from the 1950s up to the 1990s. See website for a list of games available to play. Bootleg Canyon Ziplines. Location: Boulder City, near Hoover Dam. Three-hour adventure tours on 8,000 feet of zipline. Explore Las Vegas’ Activities on Expedia! Las Vegas Monorail. The monorail services the Strip area from MGM Grand Hotel to the Convention Center to Sahara Ave. It is an excellent method of getting around and avoiding the slow traffic. RTC Transit. Convenient bus service from McCarran International Airport to the Strip and Downtown areas. For a detailed stop listing for the SDX Strip & Downtown Express and the Deuce on the Strip buses along Las Vegas Blvd. and Downtown Las Vegas, download the printable route maps (PDF files) located at RTC Maps, Schedules & Detours. Las Vegas Strip – All American Road Las Vegas Boulevard is one of America’s only nighttime byways and possibly the most concentrated collection of neon and lights in the world. A trip down the Strip is an all-inclusive way to experience the heart of Las Vegas — an adventure that captures 75 years of history, glitz, and roadside charm.